There are several kinds of worms that cause disease in backyard Chooks. The main ones are are tape worms, round worms, and hair worms. the worms have incredibly complex life cycles. Chickens can be infected both from eating food infected with droppings containing worm eggs worms and insects and snails containing worm larva. Giving table scraps to birds on a tray or paper and never onto the dirt. Keeping the area as dry as possible. 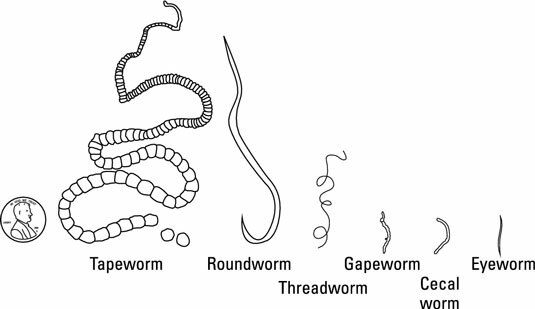 the realive sizes of the worms - one can really only see roundworma and tape worm with the naked eye. POULTRY VET TOP TIP : Look for products containing Levamisole only !